The FaceShop is proud to introduce Clean Face, specialized acne-care product to be added to your daily skin care routine specially catered for people who have acne skin or the occasion pimple outbreak over a stressful week. I may not have mentioned that I actually have 3 different sets of beauty products catering for different skin conditions at my bathroom. Our skin changes according to our lifestyle and the environment sometimes when my skin are dry I’ll switch to using hydrating and aqua based products while days like I’m super stress and pms-ing plus a few acne outbreaks I’ll use acne based products but normally I’m using the whitening range of products to lighten the few pigmentation dots on my cheeks. Care for acne-prone skin by getting rid of acne causing bacteria. It’s mild and safe for skin even with its superior anti-bacterial property. Helps kill acne bacteria, which are responsible for acne breakouts with its anti fungal, anti-viral and anti bacterial properties. With its cold nature, it soothes acne skin and helps cool skin redness. A medicated facial cleanser designed for acne-prone skin, it contains highly effective acne care ingredient – Triclocarban; inhibits sebaceous gland stimulating enzyme reduce sebum excretion. Reduces any impurities including excess oil and dead skin cells that block the pores and contains Green Tea extract which soothes and helps heal acne. Dispense an appropriate amount onto wet palms creating a foamy lather. Gently massage and rinse with lukewarm water. Clean Face Mild Toner (130ml), RM39.90Controls excess oil and sebum secretion that contains Tea Tree extract which removes acne-causing bacteria and gets rid of impurities. Dispense an appropriate amount to cotton pad and apply gently all over the face. 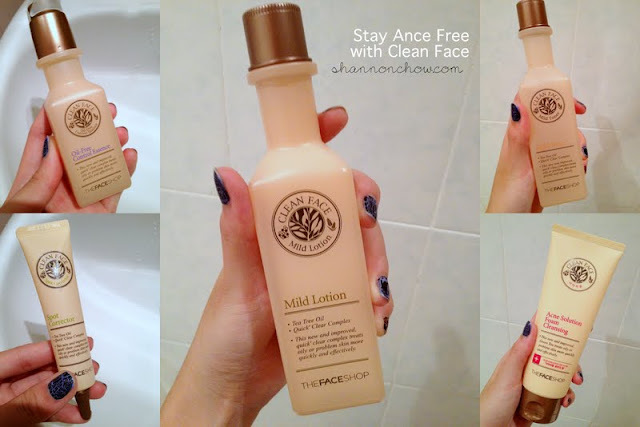 After applying Clean Face Mild Toner, dispense an appropriate amount and apply gently all over the face. Pump 1-2 times and apply onto oily area including T-zone. An over-night spot eraser that helps fade post-acne marks, keeps it handy for those irritating breakout emergencies and kills acne-causing ‘p-acne bacteria’. After cleansing, clarify the skin with toner. Then take an appropriate amount and apply with a clean finger or cotton swab on concerned area. There’s also Clean Face Sebum Control Soothing Mask Sheet, RM9.90 to complete your beauty regime of acne free with matt skin! But you may wonder, do I really need the entire set to achieve acne free skin? Well no. You don’t need a full set of beauty products. But there are some essentials ones you cannot skip, they are, cleanser, toner, lotion which is the moisturizer, acne spot corrector to treat your problem areas on your face and oil-free control essence to fight against acne in every stage. By following the basic necessary steps twice a day and treating your face with a weekly is good practice for your face, keeping it fresh and light. If you’ve already had a suncream or uv protector you may use your current brand however, do pick one that’s not oily to your skin, eventually you’ll know if the product will suit your face and skin after a long day when your back home with only slight bit of oily texture – if it’s a lot probably that suncream / uv protector is not suitable to you and this applies to BB cream too. After using Clean Face range for a week now, I love the matt texture of my skin after a long day as my skin type is combination hence normally my nose is usually shiny and oily which gathers lots of blackheads but with the Clean Face range it controls and balance my oily texture, plus my cheeks doesn’t feels dry or flaky as sometimes tea tree extract makes your skin feels extra dry but not with the Clean Face range. The scent is refreshing as well with a mild fragrance of tea tree extract, probably it’s been blended with barley or green tea extracts. So after a clean and fresh face, it’s time for me to head out with some lovely goodies on my face from Studio 20 make up kit by The FaceShop. Stay tune for my cosmetics review of the latest lovely collection of Studio 20! You can get Clean Face acne-care product range at all outlets of The FaceShop here. For more information you can drop them a comment at TheFaceShopMalaysia Facebook or visit www.thefaceshop.my. 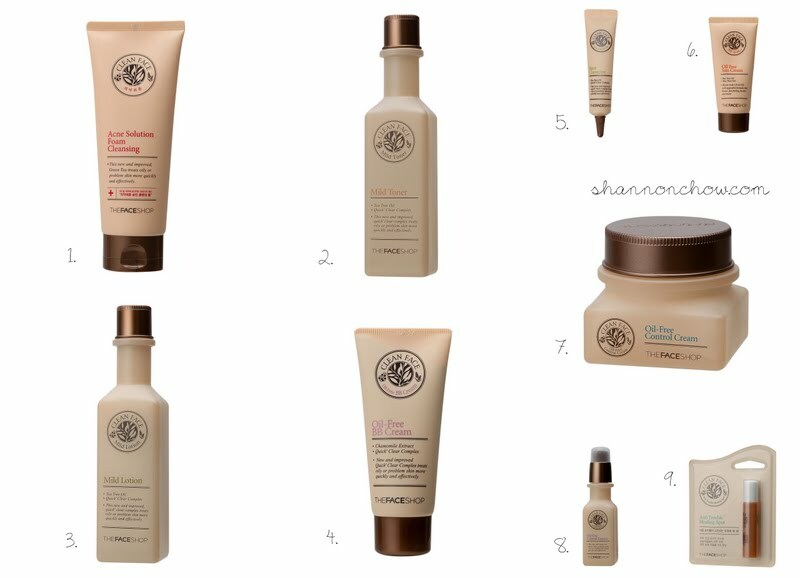 hi Shannon, do you use makeup after using these products? Hi Karen, yes I do put on light make up after using these products! However, if I have areas with pimple popping up, I would avoid foundation or use lightweight concealer to cover the areas. Nothing too heavy on my skin, so that it can breath and not causes it to get worse. For mask, I do face mask at home 3 times a week, with a mixture of hydration, whitening and anti-acne. It’s recommended to do mask, however not everyday! Hope this helps! Is this set night use or day use?is there like any specific item that is juz for night use and day use? hi, im a little curious after u put on bb cream, do u cover it with any powder after then? and what kind of powder u use? Usually I don’t use powder. If I do have to use face powder, I’ll avoid the pimple areas as I want them to breath. 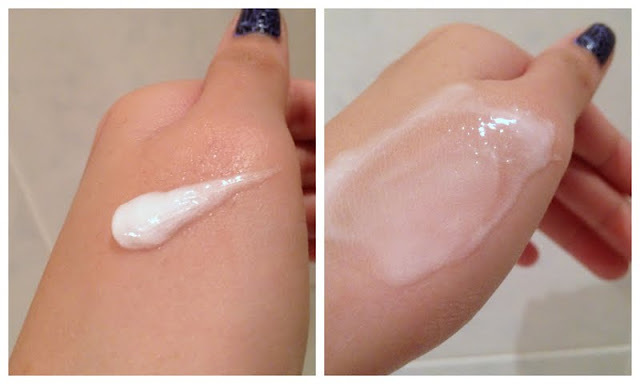 The BB cream, you should pick one that is breathable and doesn’t clog up pores. Face powder I’m using Benefit. BB cream currently I have 3. On daytime I prefer Biore as it’s waterbase & lightweight (doesn’t clog up pores at all) then for night or weekends I’ll normally use laneige bb cushion / Kose.